Want to dress as a cunning rogue, a brutal gladiator, or an otherworldly executioner? Or maybe you just want a classic look for a masquerade ball? 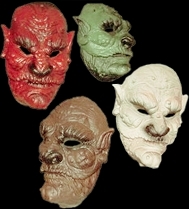 Check out our leather masks at Halloween-Mask.com. All leather masks only cover part of the face, although some are more minimalist than others. Several styles are available to go with various costume types including classic Catwoman, the Phantom of the Opera, and characters of your own making! If you have any questions about our high-quality leather masks, please contact us for more information.